You will be met by crowd of drivers at Agra Cantonment railway station if you are coming on day trip to Agra by express train in the morning. Each of them are the best and you need to hire one of them by their words. Of course it is nothing wrong to hire driver from that crowd. You just need to know how much you can negotiate. Though you’ll never get the same rate as locals, but you can try. Here is official pre-paid rate list for hiring taxi or tuk-tuk (auto rickshaw) at Agra Cantonment railway station. Additionally you need to pay 5 rupees pre-paid service charge. Haha, it has always been a quest for me to try to get the local rate when i’m traveling in india. It happens sometimes but so very rarely. Good info though, I wonder how much it differs from a deal you could find on the street perhaps. You can get better rates if you are somewhere further from such places as railway station or Taj Mahal western gate where are a lot of tourists. I paid Rs950 for A/C from Taj Mahal (South gate) to Fatehpur Sikri and then to Agra Fort. Prepaid rate would be about Rs300-500 more. But these official rates a good to know before starting negotiation as it is maximum rate drivers can expect to get. 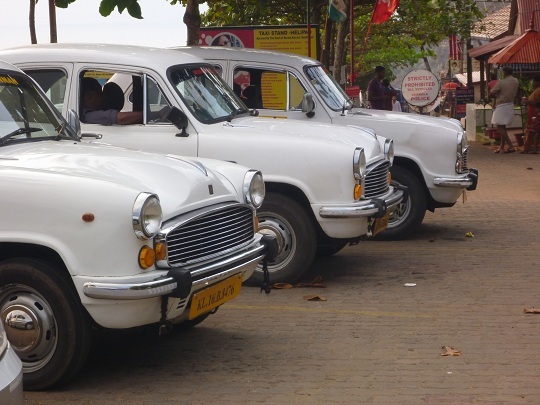 Travelling by taxis costs from Rs 8 to 16 per km depending on the vehicle and the distance of your travel across India. This is a nice compilation though and can be very helpful to visitors making short trips to Agra. Excellent information thanks for this. Do you mind if I link this on my website? It’s really useful. Laura, of course you can place a link on your website. share autos are available from agra cantt railway station to bijli ghar in 5rs. next to bijli gahr is agra fort. from agra fort to taj mahal share auto fare is 10rs.